Get actionable, authoritative and operational guidance from Part B News, the leading industry information source for practice managers and physicians. Each week Part B News brings you comprehensive Medicare Part B regulatory coverage, plain-English interpretive guidance, Fee Schedule updates, claims filing strategies, coding, documentation and payment best practices, and the latest on Congressional health care deliberations and how they affect your practice. Advance notice of changes in Medicare Part B reimbursement rules so you can prepare to comply. Guidance on how to get your claims paid to get all the Medicare Part B dollars you are legally entitled to. Plain-English interpretation of policy changes and documentation requirements so you can avoid fraud and abuse violations. Benchmarks to assess practice performance and identify opportunities and obstacles. 48 weekly issues, packed with the most up-to-date Medicare news and expert billing and reimbursement strategies to collect every dollar you deserve. 24/7 access to Part B News Online, with continuous updates on Medicare policy changes. Get advice from thousands of peers through our forums. Download time-saving tools from the online library. And search through back issues and our up-to-date library of official CMS transmittals, rules and reports. Ask a Part B News Expert – Subscribers ask their toughest practice management, billing, coding and payment questions to get clear, concise answers for free by our experts. Part B Benchmarks – Specialized data and analysis to help you assess your performance, identify new revenue opportunities and spot obstacles that may impede growth. Twice-weekly e-newsletters – Receive concise, easy-to-digest, actionable guidance and updates on practice management tactics, coding best practices and billing tips to keep you on your toes and entire staff well-trained. Breaking News Alerts – Be the first to know about big changes impacting your practice and adapt quickly with Breaking News Alerts sent directly to your inbox as news happens. AAPC, PAHCOM and BMSC CEUs – Earn 0.5 American Academy of Professional Coders CEU and 0.5 PAHCOM CEU per issues (up to 12.0 per year) by correctly answering questions based on Part B News articles. You can also earn 1.0 Board of Medical Specialty Coding & Compliance CEU per review or scenario that you submit from reading Part B News articles. 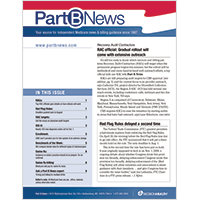 When you subscribe to Part B News, your investment is backed by an ironclad, 100% Money-Back Guarantee – If Part B News doesn’t provide you with cost-control measures and revenue boosting tips to help you collect every dollar your practice has earned, we will refund every penny you paid for your year’s subscription. No questions asked!